Shop@MustardSeed: Collective noun for HAMPERS? 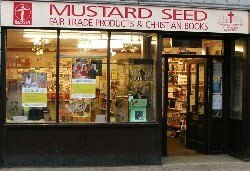 As I'm sure you're aware, without our 40+ Helpers the Mustard Seed simply couldn't be what it is. A HAMPER OF HELPERS ! Yes - that's right. A Hamper of Helpers. Ain't that just dandy? Wow! Don't they look stunning? 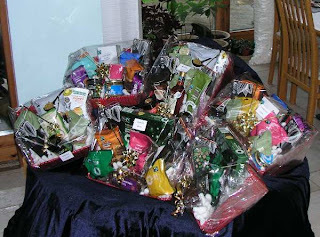 (There's six hampers in the picture; two of each of the three sizes: HUGE 14.99, ENORMOUS 19.99 & HUMUNGOUS 24.99 ) . Last orders for hampers is Friday December 3rd . In three weeks time. Delivery is then on or before Sunday 19th December - well in time for Christmas. You can order by phone (01367-241707) or email (karen@vogt.org.uk) or ORDER ONLINE HERE . You can tailor your hamper(s) entirely to your own preferences - or enjoy the convenience of letting Karen do the choosing. With wine or without wine. The contents are all Fairtrade, and the cellophane/cardboard wrapping is all biodegradable. The white expanded chips can even double up as breakfast cereal (seriously!) . And the ribbon/rosette you can reuse . There's NO CHARGE for the making. So - they not only make fantastically good presents, but they're also fantastically good value for money. Oh - and did I forget to mention that they also help all our partners in developing countries? Go on - give that special someone a special treat - you know they're worth it. The sooner you can get your order in the better. what exactly is a CARD?